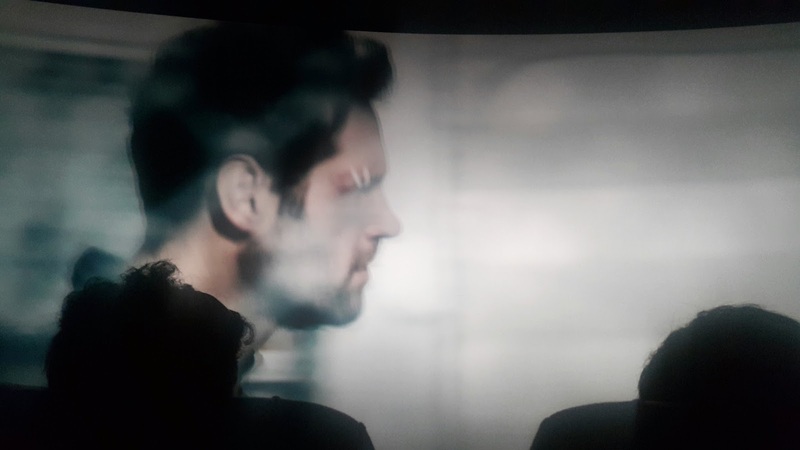 The trailer had stopped at this exact frame, and at first I thought it was either a glitch or the film projectionist's way of allowing everyone to appreciate the ruggedness of Paul Rudd's face. But then I realized the pause was so the cinema's management team could sort out the seating issue which was then ongoing for those who had booked their tickets online. Apparently, only three rows in the middle of the theater were dedicated for online reservations, so regardless of your chosen seat number you can only sit in rows G to I. My date's company and I were part of that group, but we got to the cinema early so we still had acceptable center seats. Others weren't as lucky nor were they as forgiving of the seating blunder. The first commotion we heard, even before the trailers were paused, came from behind us. A newly-arrived woman, a foreigner by the sound of her accent, was arguing with someone already seated. "So what was the point of my booking last June 19 if I couldn't get my reserved seat?" she said with indignation—mistaken with the date, I assume, unless she had come from the future. "We were told these seats are on a 'first come, first served' basis," said the walk-in moviegoer she was addressing. "And we got here first." The foreign woman repeated her argument thrice more, but met with the same response she finally gave up and headed toward a side seat. Several minutes after the trailers were paused, some guys tried to make sarcastic applause catch on inside the theater, successful only the first time out of two attempts. A long silence later, a woman at the back row asked aloud what was going on and if the issue could be resolved quickly because "kawawa naman 'yung mga nakatayo" ("I feel bad for those standing up"). I didn't care much for it then—the break in the trailers allowed me some time to check on my SimCity BuildIt metropolis on my phone—but I was curious so I investigated by trying to book Jurassic World tickets via SM Cinema's website today. The blue cells are the ones I selected. 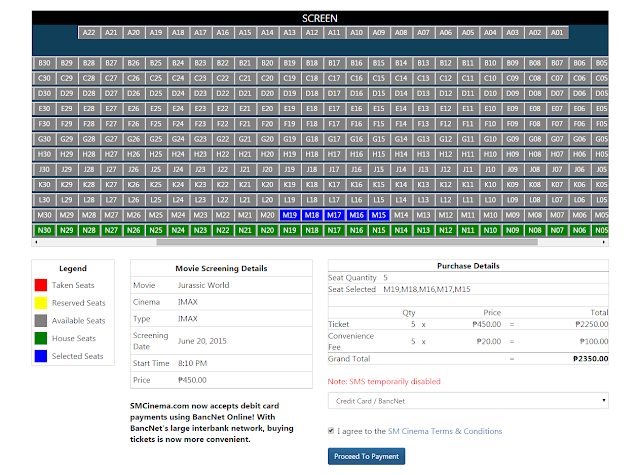 The root of the problem seems to be this page that allows one to select any seat in the IMAX Theater when booking a ticket. If row allotment for online reservations was indeed just from G to I, then I shouldn't be allowed to select, say, row M seats, like I did (highlighted blue in the screenshot above). There wasn't even a pop-up message about it when I proceeded to the next page, and nowhere else on the SM Cinema website, not even the FAQs section, does it say only certain rows are allotted for online reservations. I didn't try to go further because that would entail actually paying for the tickets, but if SM Cinema is still allowing their site visitors to reserve any seat in the IMAX Theater only to be told come movie time that their reservations are moot, then I can only imagine how stressful it has been for their managers-on-duty (which might explain why there apparently has been rapid career movement for their theater staff, as my date's friends have noticed since they last came to the Megamall IMAX). About ten minutes since the Ant-Man trailer was paused back at the cinema, Paul Rudd returned in motion and we all had to wear our 3D glasses again, so the seating issue must have eventually been sorted out, at least for that screening time. 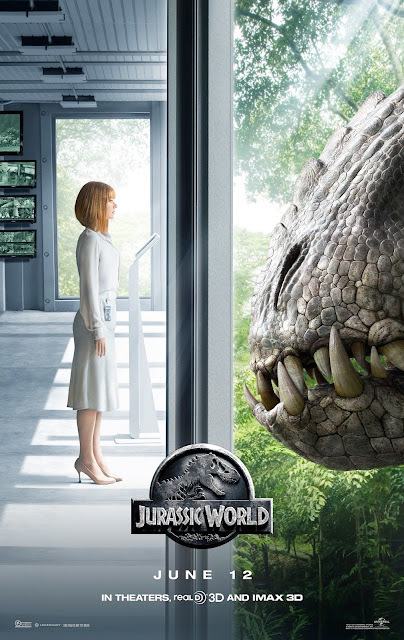 As for the film, Jurassic World is visually stunning in 3D and thrilling enough to make us forget about everything that recently happened. I just felt like it was lacking in new dinosaur species to introduce to its audience. Over a decade since Jurassic Park III and all they could add to the roster are the winged Dimorphodon, aquatic Mosasaurus and genetically-modified Indominus rex. As magnificent as those creatures were, however, they paled in comparison to Claire Dearing, the dinosaur theme park's operations manager played by Bryce Dallas Howard. Even in heels she had been wearing for more than a day she can outrun a full-grown Tyrannosaurus rex. That's certainly more impressive than a hybrid dinosaur who can camouflage and evade thermal imaging.